Anterior cruciate ligament (ACL) injury is one of the most frequent injuries in sportsmen with a reported prevalence of around 68.6/100,000 per year . ACL reconstruction (ACLR) is one of the most commonly performed orthopedic procedures. An ACL-deficient knee shows an anterior laxity and a variable degree of associated rotational instability. A variable injury to the lateral capsular ligament structures has been hypothesized in the onset of rotational laxity. Historically, anterior laxity in ACL-deficient knees was surgically treated with isolated extra-articular tenodesis, as described by Lemaire or MacIntosh. This procedure was effective in reducing the rotation of the tibial plateau relative to the femur; however, isolated extra-articular reconstructions provided only moderate control of anterior laxity. In addition the overall long-term results of these procedures were poor, and only few patients reported good to excellent results. 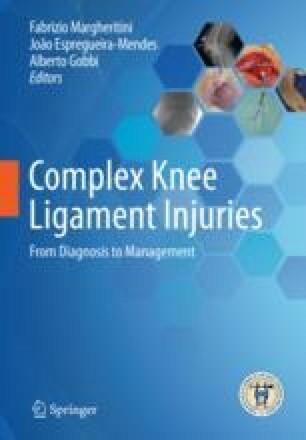 The main drawback of these techniques is that they do not restore the function of the ACL in preventing anterior tibial translation in the medial compartment. These procedures were largely abandoned when single-bundle intra-articular ACL reconstruction emerged as the gold standard surgical treatment of ACL tear. However, traditional transtibial ACLR had the disadvantage of interrelated tunnel preparation. This may lead to a vertical femoral tunnel, with insufficient pivoting control. In fact the most common problem after ACLR is the residual rotational instability, which has been described in 11–30% [2–4].